Below are some of the times The Hayes Group has been featured in the news and press. Jan. 2017 – Tribute to Merwyn Hayes by Stephen Hayes, Virginia Association of Broadcasters President, in January 2017 VAB Newsletter. Who is your role model? Why? Mar. 27, 2016 – Business Milestones highlight on the newly appointed President of The Hayes Group International, Dr. Michael Comer, as featured in Winston-Salem Journal, click here to read the article. Jan. 29, 2016 – Spotlight feature on the newly appointed President of The Hayes Group International, Dr. Michael Comer, as featured in Triad Business Journal, click here to read article. Jan. 2, 2016 – Interview with Dr. Michael Comer on ‘grey cubicle syndrome’ as featured in Winston-Salem Monthly Magazine, click here to read article. Apr. 30, 2012 – Dr. James Thompson at the ACPE annual meeting as featured on Paul Levy’s Not Running a Hospital blog, click here to read the article. Nov. 18, 2011 – Excerpt from Start With Humility: Lessons from America’s Quiet CEO’s on How to Build Trust & Inspire Followers as featured in Training Magazine, click here to read the article. June 23, 2011 – Radio interview with Dr. Michael Comer on Start With Humility: Lessons from America’s Quiet CEO’s on How to Build Trust & Inspire Followers as featured on Dresser After Dark, click the play button below to listen to the interview. Sept. 14, 2011 – The Hayes Group International’s Start With Humility book tips applied to IT careers as featured on CIO Insight, click here to read the full article. Jan. 27, 2009 – The Hayes Group International tips for restoring productivity and morale after layoffs as featured on CBS Money Watch, click here to read the article. 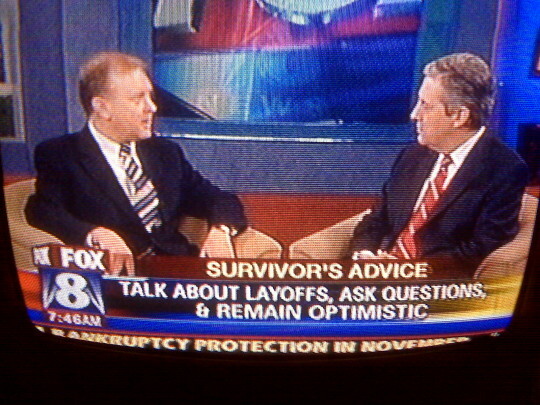 This article was also featured on an interview with Dr. Michael Comer on Fox News as pictured below. May 31, 2016 – Hayes Group International now on the GSA Schedule – click here to read full press release. Jan. 1, 2016 – The Hayes Group Names New President as Part of Business Continuity Plan – click here to read full press release. Oct. 15, 2015 – The Hayes Group Returns from their Leadership Experience in Tuscany, Italy – click here to read more about the event. Nov. 4, 2014 – The Hayes Group Returns from their Leadership Experience in Asheville, NC – click here to read more about the event. Oct. 1, 2013 – The Hayes Group Returns from their Leadership Experience at Mackinac Island, MI – click here to read more about the event. Nov. 29, 2012 – The Hayes Group Returns from their Leadership Experience at the K Club in Ireland – click here to read more about the event. For leadership resources and our latest news, please also visit our Newsletter Archive or join our mailing list to be among the first to receive our emails!